Not to be confused with World 5-3. Area 5-3 is the third course of Sandstorm Steps and the thirty-ninth course overall in Mario vs. Donkey Kong: Mini-Land Mayhem!. 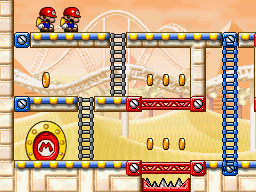 Both Mini Marios begin at the top left on a platform on the upper level, with the exit door on the bottom left. In order to reach it, they must be guided via Red Girders and the Ladders nearby to it. The M-Token is located near the middle right, atop a Red Girder platform just above the Mini Mario Card. To collect it, a Mini Mario must simply follow the Blue Ladder from where the Mini Mario Card is and turn around to it. The Mini Mario Card is located on the bottom right, atop a platform on the lower level right next to a Blue Ladder and a Spike Trap. A Mini Mario must fall down the first stagnant Ladder from their starting position, then fall on a Red Girder platform on the lower level to reach it. They must then use the Blue Ladder to avoid falling into the Spike Trap. This page was last edited on September 18, 2018, at 06:19.